The Diridon Station in San José, located adjacent to downtown, is currently served by Amtrak, Caltrain, ACE, and the VTA light rail. With BART extension to Silicon Valley and the California High Speed Rail corridor to San Francisco and Los Angeles, Diridon will become the largest multi-modal transit station west of the Mississippi. Dyett & Bhatia is assisting the City jointly with Field Paoli Architects. Dyett & Bhatia is leading outreach, land use planning, and urban design, assisting the City of San José, the Redevelopment Agency, and the Santa Clara Valley Transportation Authority (VTA), on developing a plan for a ½-mile radius around Diridon Station (approximately 500 acres of land), with extensive reuse opportunities. The Station Area Plan will provide a vision and guidance for this unique destination with a mix of transit-supportive uses, including residential, commercial, and public services. 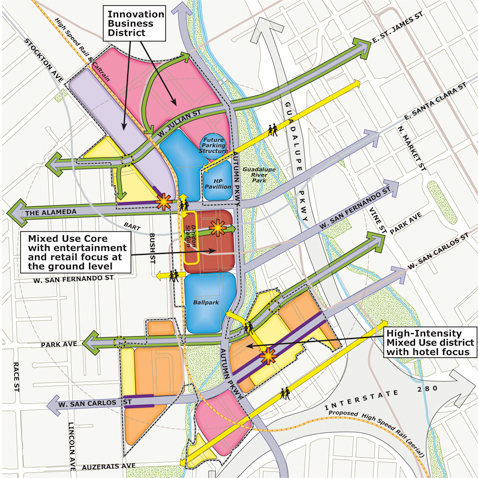 In addition, the Plan anticipates pedestrian, bicycle, open space, and street connections from downtown and surrounding neighborhoods.